Only one year after our last visit to Copenhagen so many new places opened. The city is always beautiful and inspiring and it’s necessary to go back there often in order to discover new food trends, design interiors and buildings mixed in its traditional and colourful beauty. This time I visited Denmark with Lidia, a dear friend and someone who is Copenhagen cultured. We selected lots of places we wanted to check before we left. We also found new ones simply by walking around and as well, some were suggested by VisitDenmark who supported us with Volagratis. 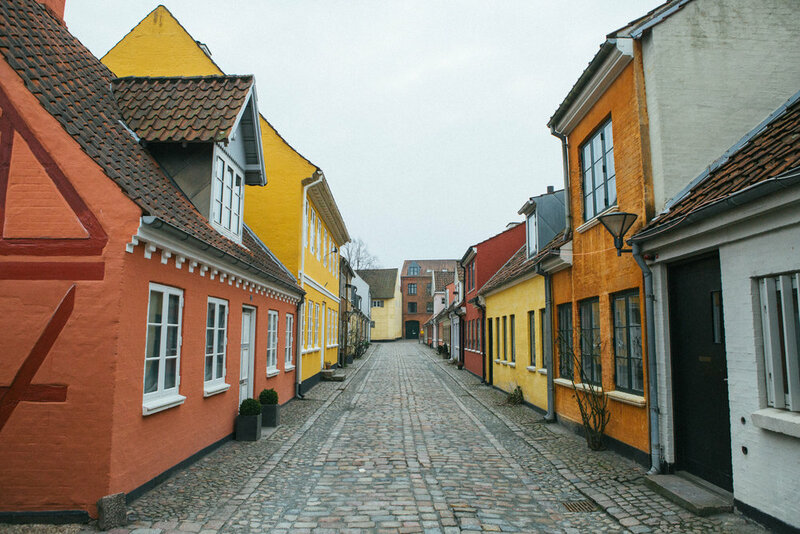 During the 5-day itinerary they recommended for us to visit Odense, a pretty city just 1 hour and a half far from the city. This story will integrate the full Copenhagen map which we created on the website with the places we visited during our last two visits. As a photographer I want to suggest to plan your days thoroughly, especially because during the winter, a big part of the day is dark and the weather is usually foggy. So, if you want to take good pictures with natural light, remember not to leave your hotel or apartment too late because it will get dark early. Also remember to book restaurants or try to get there when they open in order to be able to take some good pictures of the interiors when it’s not full of people inside. The cafe is set out as a large space with a central coffee station in the middle, so you can watch your coffee being made from wherever you’re sitting. As well as watching the process of our drinks being made, we had our eyes on the aprons the baristas were wearing too. We starting talking to Yakob, the main barista, about our love for coffee and the aprons and he was pleased to tell us that they were from Yellow Stuff. Yellow Stuff is based in Bangkok, and creates aprons specifically for baristas, as they believe the expertise should be praised and have an outfit to match. They use cotton, linen and canvas with good quality leather to produce aprons appropriate for a working barista, and they even do customised ones too. We loved the aprons so much we got in contact with Ake from Yellow Stuff and were lucky enough to collaborate with the brand. Yellow Stuff resonated with us because at Fusillo Lab, we make an effort to seek out only high quality things that resemble our style. When we first noticed the aprons, we knew they would be a perfect addition to the Lab as we too share their love for baristas and all things good coffee. The very first place I want to suggest has to be a cafè that is a roastery as well, obviously. 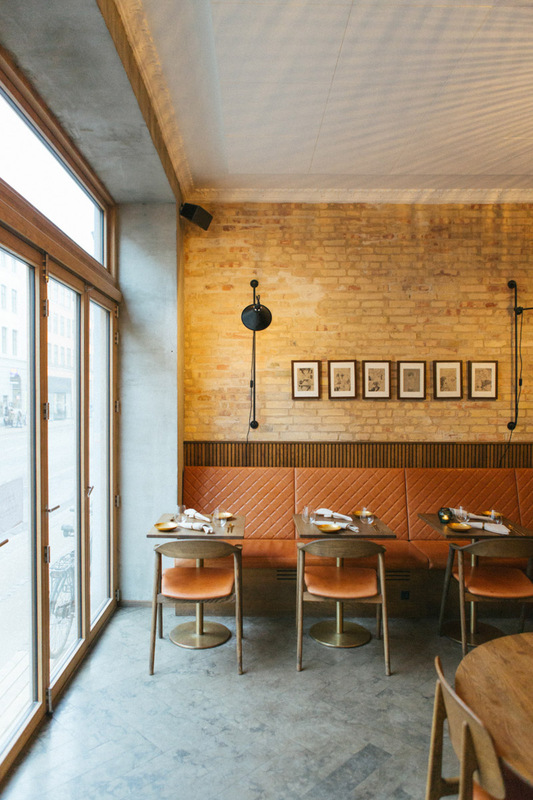 Andersen & Maillard is one of those cozy places where the materials have textures and are original: wood, concrete, iron, marble. The light comes from big windows and coffee bean bags are placed all around. It’s a mix between a minimal design studio and a proper coffee factory. The coffee is great and the croissants are very well made. This place is really close to the hotel where we stayed and 1 minute walk from the railway station, so it’s a good choice for a breakfast in the early morning or before you take a train (to Odense, for example). The interiors have a good colour palette and everything is very well-finished. The coffee is self-roasted and sold in three different coloured packages without any label. I loved the La Marzocco Linea on the bench and the little circular marble tables in the corner. This place is always my favorite… I can’t be in Copenhagen and not visit it. The industrial building is one of my favorite ever. It looks like a laboratory, with all the coffee machines and brewing accessories around that you can see on the right as soon as you walk in. On the opposite side there are some wooden tables next to the industrial windows and a grand glass wall shows you the big roastery behind the café. The coffee and food are amazing. This time I chose a Kenya single origin coffee to be made at home. 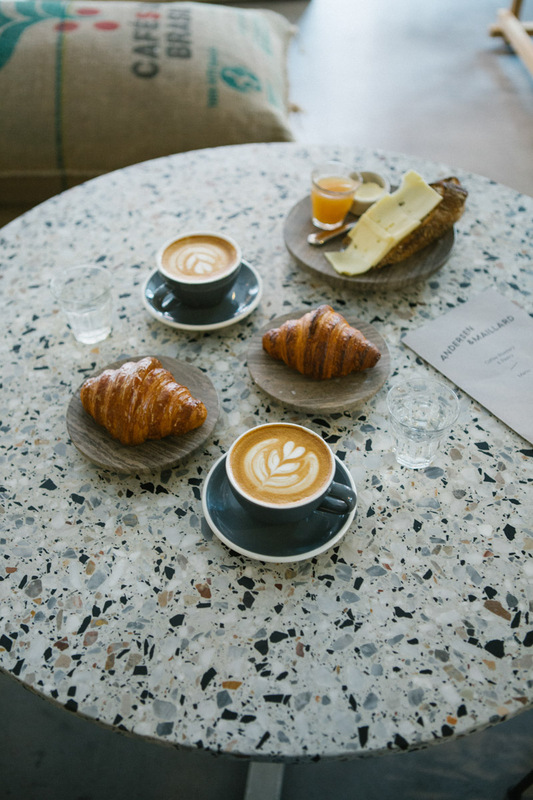 If you wake up in the morning craving a fresh baked croissant or cardamon bun, just head to Juno. The place is very small but the good smell is in the air of the neighbourhood. 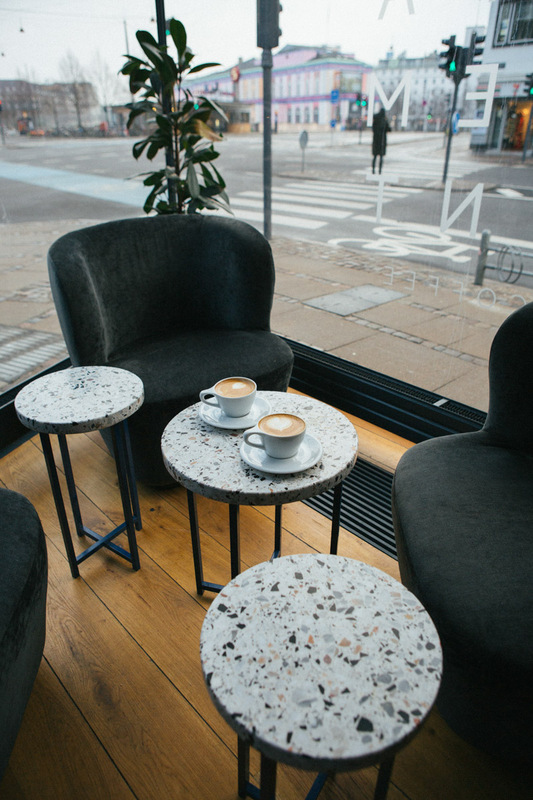 There’s a little table inside to enjoy a cup of filtered coffee or a bench outside. This is the first tacoria we visited and found out that the place is known for being featured on Ugly Delicious on Netflix just after. This is a good stop if you’re around the Meat Packing District. The style is very mexican so if you’re a fan don’t miss it. I’ve been intrigued by this recipe of taco bread that I didn’t know. This colour comes from the rich taco culture in the North and Latin American street art. They make the bread starting from organic blue corn, that is naturally gluten-free. Blue corn has 20% more protein and a lower glycemic index. The colours of their recipes are really beautiful and I personally wanted to try them all. Unfortunately I had to save some space in my belly for other delicious bites. This place is cool and so interesting to visit. 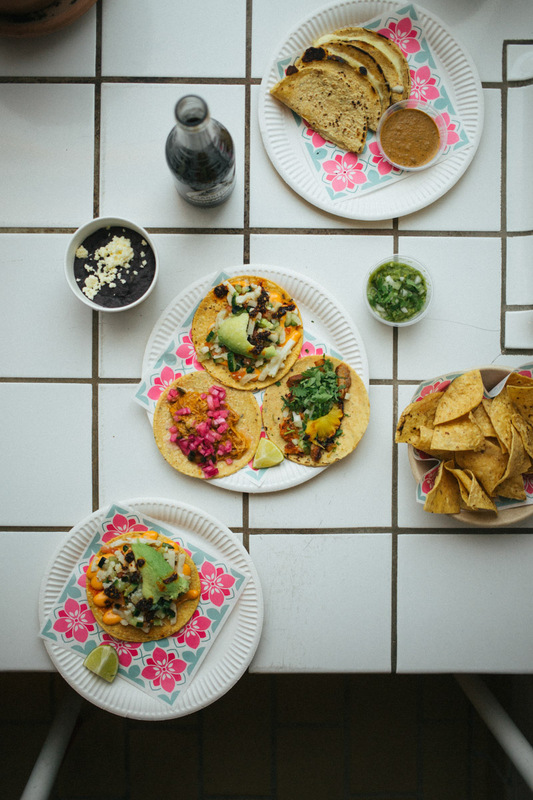 The neon lights and illustrations of mermaids or devils on the walls make the tacoria have an exuberant personality. The taste of food is a bit lighter and less spicy than Hija De Sanchez. You can taste the delicious Mikkeller beer, since this restaurant is part of their locations. I just mentioned a group of restaurant locations by Mikkeller. During this trip I tried some of them and this ramen bar is definitely worth it. The details are selected and very iconic with a taste of irony. 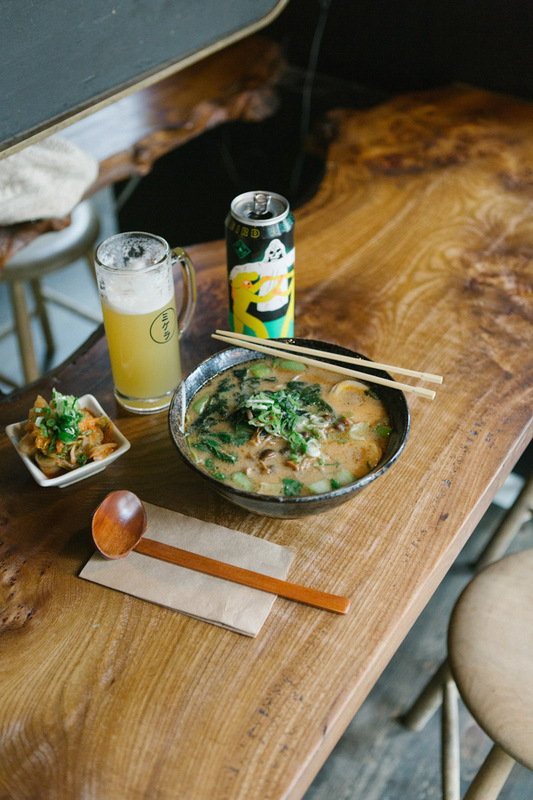 You can select your favorite ramen and beer from a button machine and get your meal straight after. As soon as I saw Norman, Slurp Ramen’s mascot, I immediately thought I wanted to get there and slurp the ramen (I’m still craving ramen while typing). The quality of this place goes beyond graphic design: their ingredients are high quality and they’re selected locally from the motherland. The story of this place is really interesting. We were lucky to have been welcomed by the owners an hour before they opened for the lunch and were told about the whole construction of the restaurant on a floating platform. They made almost everything by themselves: the tables, the chairs, the bar. This is their approach: to be homemade and if it’s not possible, at least locally supplied. We had the best smørrebrød, hot smoked trout mousse and crispy vegetable steaks. The place is in a new area and hopefully next time we’ll be able to visit more around there. You can reach Vandvid by harbour bus 991. It takes a little time but it’s definitely worth it. When we decided to book a table at Kiin Kiin Bao Bao they said the only seats available were at 5 pm or 9.30 pm. We went for 5pm, opening time… It seemed like afternoon tea but as I said before, Copenhagen in March gets dark quite early, so we got to take perfect pictures of the restaurant with natural light. And since they had just opened, the space was empty. Beautiful! I’ve never been at the ex Noma building before. Restaurant Barr has been a great point to start from, especially during a weeknight dinner. We had dinner at the Beer bar, a 30-seat bar open seven days a week where you don’t need to book. They work closely with independent beer breweries to find a unique selection of beers for their guests that changes quite often. The kitchen is spectacular too, following the traditions of the Northern Sea region. The first aspect I liked of this place, aside the fact that it has been awarded as one of the best cocktail bars on Earth, is the choice of neutral colours and natural light during my favorite time to enjoy a drink: Happy Hour. The interiors are really well selected with a timeless design: a great and comfortable bench, some seats near the windows and a more intimate area. As a Negroni lover, I loved my twist made with Amer Picon, a orange bittersweet French aperitif. As soon as I stepped in front of the Brønnum building, I got stunned by the beauty of it. The facade and the interiors are totally consistent with each other. It’s a proper bar for a cocktail before or after dinner, with colleagues or friends, due to the friendly area on the bench or by the big windows where you can see the streets outside. If you want an intimate area, just walk behind the door or book a private night at the Brønnum’s private dining room. If you’re ready for a good beer and you want to be surprised by the selection of Mikkeller, just pick a beer shop. I loved the raspberry-flavoured one I tried. I recommend to buy some cans and chips to be saved for later. This is one of the ex-industrial places I always fall in love with, especially if they’re restyled keeping their authenticity and personality. In this old iron foundry and locomotive factory in Copenhagen, Brus means brewing, kegging, cooking, shopping, dining and drinking. The word “brus” is used when a liquid obtains a sparkling quality when carbonated. It’s the right place to socialise and support local breweries. If you need a hangover cure, Brus serves an amazing brunch every Saturday and Sunday. Yume is a Japanese work for Dream. Their Dream is a sustainable world. That’s why they started this project that it is half a shop and half a magazine: they want to tell stories about people who convey a sustainable life, trying to inspire other people to do the same. At the same time, they support and sell products from local artisans. They call this will to help people and their opportunities Yume Promise. We walked past their shop and it looked very interesting. It’s one of those times when I feel proud to be a curious person. This shop is a must to stop by every time I go to Copenhagen. It’s the right place to pick jars, glasses and kitchen tools that I can take back to Fusillo Lab. In Denmark, Hay is famous because of their iconic design. Hay is the temple where you can admire all their amazing furniture and accessories. Even if Hay is everywhere nowadays, I suggest to visit ‘Hay House’ to check all their new products and take beautiful pictures of the spaces and of Amagertrov square. When I walked into Hotel Danmark I immediately had the same feeling I had when I stayed at Hotel SP34… I can tell this is part of Brøchner Hotels! My room was in the new section of the building (the green one) and it had dark tones, with a beautiful view of the palace on the opposite side of the road and a pretty balcony where I took a picture of the Hotel sign. I got to see the fireworks of Tivoli from it too. We had a tour of the hotel and I can say that it’s all beautiful, from the cool room with bunk beds to the most luxurious suite. The breakfast is entirely organic and very delicious and the wine hour is amazing if enjoyed on the rooftop terrace. Even if it’s been my third time in Copenhagen, this is my first visit to Tivoli. As you know, I’m not a huge fan of touristic and entertainment activities, but Tivoli is definitely not something like that. From what I saw, Danish people like spending a good time there, having dinner or a snack or simply a walk. It’s a beautiful park and visiting it is really worth it, especially if you decide to get the Copenhagen Card, that entitles you free access. This is my favorite working space in the city, the headquarters of my favourite magazine. This time they changed the interiors a bit but I spent some time looking around, checking what was new there. I wanted to say thank you to them for sending the previous issue to me so I decided to buy the newest one. It’s been my first visit to a university during a holiday. The design of the University of Copenhagen by C. F. Møller Architect is stunning because of the geometry and wooden and copper materials. The external shutters move depending on the sun and reduce the energy consumption. We took a tour around and loved the spiral staircase the most. The highest level is free-entry and gives a beautiful view of the city. Superkilen is an urban park project built in the area of Nørrebro. The concept is to support and engage citizens around the park, one of Copenhagen’s most diverse neighbourhoods, each one participating supplying at least one artifact or idea. 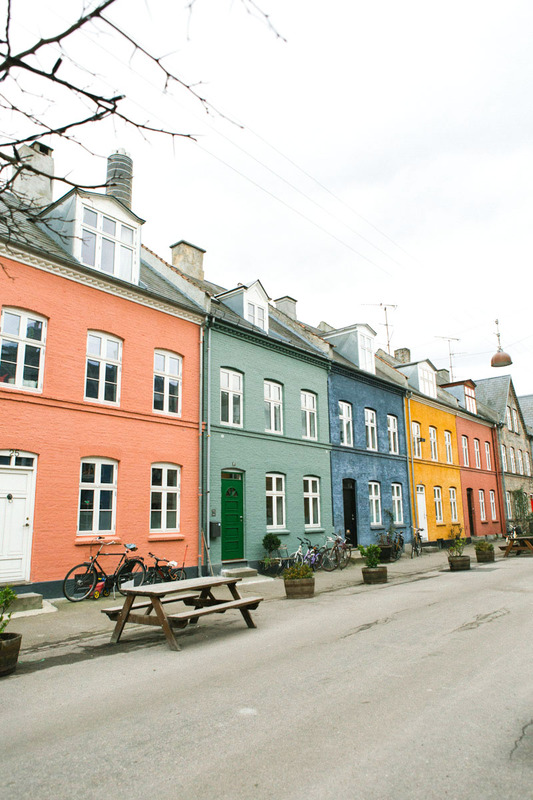 It’s the street of the coloured houses, an iconic corner of Copenhagen with Nyhavn. I recommend to walk across this street and find yourselves in a little and colourful world.